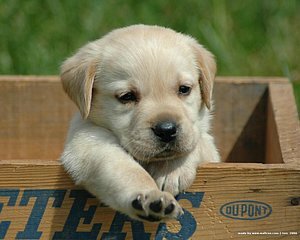 The Labrador Retriever (also Labrador, or Lab for short) is one of several kinds of retriever, a type of gun dog. They have webbed paws for swimming, useful when they retrieve their prey, hence why they are called retrievers. The Labrador, once known as the Lesser Newfoundland, is the most popular breed of dog in the world, and is, by a large margin, the most popular breed by registration in Canada, the United States, and the United Kingdom. It is also the most popular breed of assistance dog in Canada, the United States, Australia, United Kingdom and many other countries, as well as being widely used by police and other official bodies for their detection and working abilities. Labradors are very athletic: they love to swim, play catch/frisbee, and are great with young children.